The newest in Denver based company Gotrax’s line of electric scooters hit the market in summer 2018, and is already making waves in the personal transportation market. It’s called the Gotrax GXL Electric Commuting Scooter and is a particularly interesting option for anyone looking to cruise through town gas-free. Along with the already popular Xiaomi M365 this is one of the most affordable options right now, and judging by the reviews on Amazon, this is proving to be just as sought after – maybe even more so? The scooter will cost you less than $500, which is great if you’re a college student or city worker who faces long commutes on a daily basis. This is a particularly impressive price seeing as many of the best rated commuting electric scooters cost in the range of $700-$1200. Of course just because its a “commuting” scooter doesn’t mean you can’t use it to cruise around the neighborhood on lazy afternoons, although this probably won’t be the best way to make full use of its (relatively) powerful motor, its specially-made commuting tires, and a bunch of other bells and whistles that can only be enjoyed when you take it out for a spin around town. 7 Gotrax GXL vs Xiaomi M365 – who is the winner? The scooter is designed for city commuters, according to the manufacturers. They do an excellent job of making sure your tires don’t tap out after a hectic day of riding by fitting the scooter with non-slip 8.5-inch pneumatic tires. These tires don’t wear as quickly as those of other scooters, which is precisely what you want if you’re on the streets every other day. The tires are also designed to make the ride a lot smoother, and with the help of a few features we’ll look at later, they do this excellently. The engine has a 250-watt motor, making this the most powerful GOTRAX scooter you’ll find on the market. The engine clocks speeds of up to 15.5 miles per hour carrying a maximum weight of 220 lbs. The average adult weighs about 200 pounds, so rest assured this scooter won’t wheeze and stutter under your weight. You can also expect to get from point A to point B faster than you’d typically expect to on an electric scooter; some good news for the speed demons out there. Depending on the terrain and your weight the GXL can actually manage up t0 18 or more mph. Coming to a sudden stop when you’re going at over 15 miles per hour on a scooter requires some serious stopping power on the scooter’s part, which is why this electric scooter features a front and rear double-braking system. This powerful braking system to bring you to a safe halt even when cruising rapidly downhill, but just to be safe, we don’t recommend doing so too often. The scooter is advertised as reaching up to 12.5 miles on a single charge. That range would probably be for absolute optimum conditions (flat terrain, carrying a low – average weight etc.) It’s probably possible to hit 12.5 miles but this depends on a number of different factors and its unusual to hit a range quite as high as the manufacturer advertises. At about 180lbs your should get just over 10 miles on a single charge – maybe a bit less if you weigh more. The battery can be charged in about 4-5 hours though which is pretty quick. This scooter, despite being a commuting scooter, can just as well serve as a cruising scooter because it has 2-speed settings. The first gear lets you ride at a nice, brisk pace while the second kicks it up to speeds of over 15 miles per hour. In the end, you get more control over how fast you want to go and consequently, how much battery you want to use every time you leave the house. Non-slip treads will do you a world of good when riding in the rain, but without decent shock absorbers, you’ll feel every bump and pothole you encounter. That’s not something to worry about with the Gotrax GXL commuting electric scooter, however. Its tires are fitted with pretty decent shock absorbers; the kind that will ensure you don’t bounce off the scooter if you hit a rock at 15 miles per hour. One of the main reasons why everybody wants a scooter is because they can go anywhere you want them to. This is no different, and its foldable frame, which features a quick-release lever, lets you take it indoors with you as well. Storing it is a cinch even in small spaces, so this is an electric scooter worth looking at if you’re living in a cramped college dorm or something along those lines. Its also easy to stow away in the trunk of your car, on public transport etc. Some people have even managed to fit it into their gym lockers. What’s an electric scooter without a speedometer called? Unsafe! And for that reason, the manufacturers throw in a nifty display right between the handlebars where you can see the speed you’re travelling at. 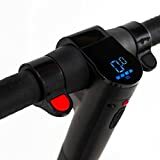 Here, you’ll also find a battery life meter, the gear lever, controls for accelerating and braking, and a switch for a bright LED headlight because you never know when you’ll be riding in the dark. Waterproof rating: IP54 – this means its water resistant (splashes, light rain etc), but NOT waterproof. If you live within a few miles of your office building, school, or campus, this is a rideable that would suit you just right. Getting to and from work or around the college campus is decidedly easier and much smoother on a scooter of this caliber especially since you don’t have to keep recharging it. This is definitely a scooter for getting around quickly and, most importantly, its affordable. It is designed specifically to handle city terrain and it handles it well. This one is definitely not a scooter for the kids, although teenagers will definitely love it. If you do want your child to have a go, from age 10 onwards should be able to control it, but the handlebars are not height adjustable so it does depend on the child’s height. Decent tires – don’t expect these to wear out easily. Pneumatic tires also means ease of travel over a variety of different terrains. It’s quite fast for a scooter at this price range. It might not be the fastest on the market, but along with the Xiaomi is certainly the fastest for the price. And the speed is more than adequate for city commuting. It is foldable, therefore easy to store or move around indoors. A folding electric scooter is always good for taking on public transport. Impressive range – Gotrax suggest over 12.5 miles range but I would suggest its probably closer to 10 (depending on your weight, speed travelled, terrain etc.) That’s still pretty good for a single charge though, and charge time is fast. Max weight is just 220lbs. This does seem to be the standard max weight for many personal electric vehicles though, and when they say this is the “max weight” it usually means its the max weight for optimum functioning. You could probably get away with an extra 10 or 20lbs but you probably wouldn’t be able to hit the same speeds. Extra weight might also affect its ability on inclines. It comes with UL2271 Certified e-scooter batteries and has excellent build quality. You can ride a little easier knowing that you’re running on batteries that won’t peter out prematurely and that are safe and Underwriter Labs Certified. Of course for your own safety when riding I’d recommend a helmet and knee/elbow pads but that’s up to yourself whether or not you are going to wear them. The front and rear brakes work well and add to the safety. Gotrax GXL vs Xiaomi M365 – who is the winner? The big question, how does it fare when compared to its Chinese counterpart? For many months now the Xiaomi M365 has been the cheapest way to replace a car or public transport in most cities. 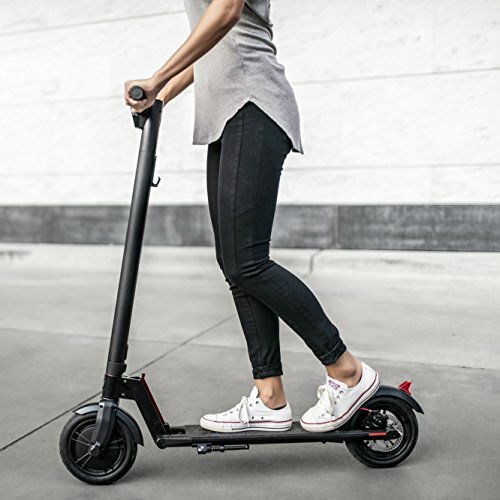 It has also been the scooter of choice for start up dockless scooter share companies such as Bird and Spin, so many potential scooter commuters have had an opportunity to try them. So how does the newer electric scooter compare? The advertised speed and range for both are the same – 15.5mph speed and 12.5mph range. They have the same 250 watt motor. The price difference between them varies – shop around and see where you can get the best price. Right now the GXL commuting electric scooter on Amazon is and is usually the cheaper of the two, but Gearbest sometimes do flash sales on the Xiaomi. The Xiaomi comes in both the original version & a European version which comes with European charger, English manual and spare tires (the European version costs more). It can be shipped to most countries from Gearbest or Aliexpress. The GXL commuting scooter is only available in the US. All in all, they’re both great scooters. If you’re in the US you have the choice of both and you’ll get a pretty similar ride. If you’re outside the US the Xiaomi will be the better option as they ship to most countries worldwide (do enquire about import charges to your country though before you buy). The Gotrax GXL is available on Amazon.com in three different colors: blue, black, and white. It’s also available on the official website, although personally I prefer Amazon for free shipping, great prices and reliable customer service. It’s well worth visiting the listing on Amazon just to check out the user reviews. Whether it is top speed, excellent front and rear brakes, impressive build quality, battery life, or overall portability you’re looking for, you can see from our Gotrax GXL review that this is definitely impressive, especially for its very affordable price. This lightweight yet powerful electric scooter is great when it comes to long-range riding and speedy commuting (and actually hitting the speeds that Gotrax advertise). The city scooter can handle its terrain well since its tires are specially made just for that purpose – urban riding. Because its got air filled tires though it can handle bumpy ground and other terrains pretty comfortably far better than solid rubber tires would. It is quite easy to control, being as lightweight as it is, and won’t give you any headaches whatsoever when it comes to finding storage since it fits snugly in compact spaces. So its perfect as a last mile (or more) solution as is, but also easy to fold up and use on public transport or stick in your trunk when necessary. In my opinion this is a steal at anywhere under $600, and for the price its available at right now, its no wonder that so many people are snapping this up and taking to the road! This is one of the few electric scooters that consistently hits the advertised speed of 15.5mph (and actually exceeds it sometimes)! It’s strong, durable, a smooth ride, and is without a doubt one of the best on the market at this price point. Recommended.